New flashing beacon will be installed at this unmarked crossing where people often drive as fast as 50 mph east of 138th. Marine Drive is a gem in our cycling network and a thorn in our cycling socks at the same time. 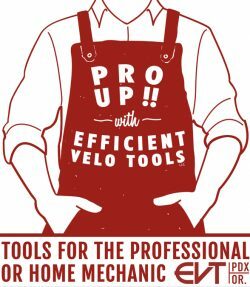 For as great as it is in some spots — and as valuable as it is as an east-west connection between St. Johns and Troutdale — it remains neglected and riddled with dangerous gaps that prevent it from being a truly great route for cycling. 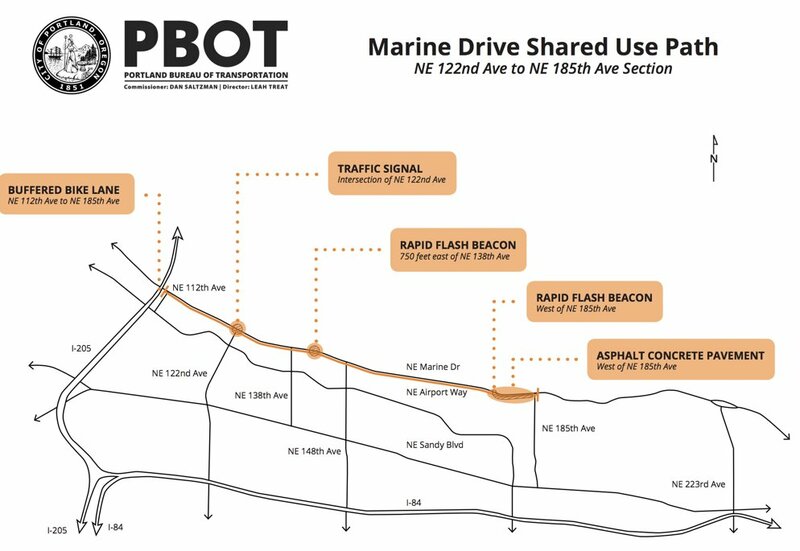 If you love/hate riding on Marine Drive, we’ve got two bits of great news: There’s a new advocacy effort afoot to close the gaps, and the City of Portland has just put real money on the table to close a few of them by next summer. Work by Jim and others at 40-Mile Loop is beginning to pay off. Earlier this month, the City of Portland announced $1.7 million in funding for a project that will add a buffered lane and other safety upgrades between I-205 and 185th. With $589,000 in Parks System Development Charges (supported by Commissioner Amanda Fritz), $50,000 from the Bureau of Transportation’s Vision Zero program (Marine Drive is listed on their High Crash Network), and a $1.1 million federal grant (via Metro Regional Flex Funds), PBOT plans to redo the lane striping to provide more room for cycling on this 3.7-mile stretch of the roadway. In addition, they’ll install a new traffic signal at 122nd (site of many collisions), add rapid flashing beacons where the path crosses the roadway east of 138th and west of 185th, and repave the existing path west of 185th. PBOT says construction is due to start early 2019 and should be completed by next summer. For Jim Sjulin and the 40-Mile Loop Land Trust, the work is just getting started. They’ve already been meeting regularly with PBOT, Parks, Metro, the Port of Portland and city planners in Troutdale, Fairview and Gresham. Now they’ll move into a public outreach phase and look to connect with neighborhood groups. 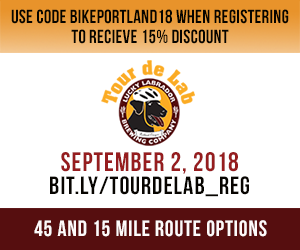 Get involved and learn more by emailing info@40mileloop.org, visit their website, or connect with them on Facebook. Also don’t forget to put Metro’s Quarterly Trails Forum on your calendar. The event is a perfect opportunity to connect with advocates and agency staff working on this and many other regional projects. The next one is on October 24th. The post City will close two gaps, add safety features to NE Marine Drive appeared first on BikePortland.org.